Today is a holiday in Italy. It is the day that commemorates Italy becoming a republic. Somewhat like our Fourth of July. 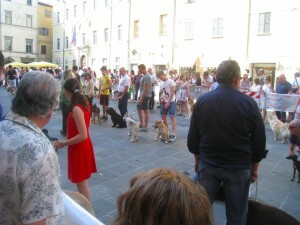 In Umbertide they celebrate with a dog show. No it is not Westminster. The dogs and there were many of them are family pets, most of indistinguishable breeds. Italians are just as foolish over their dogs as Americans. You can find many families out and about walking their dogs in the early evening, even during winter. 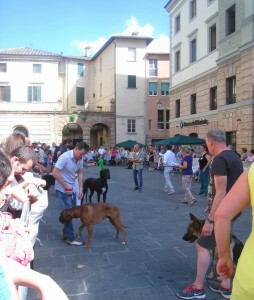 The piazza was filled with dogs of every size and shape acting like well, dogs. In fact during their waiting time in the corral, one competitor decided that he needed to show who was boss and got a bit ugly. Others tried to hold their own with him until eventually the show off was moved to a corner. The owners got a work out just keeping the pets entertained. I watched for about an hour and the show was still going on when I left. I am not sure what it takes to win but everyone seemed to be having a good time. 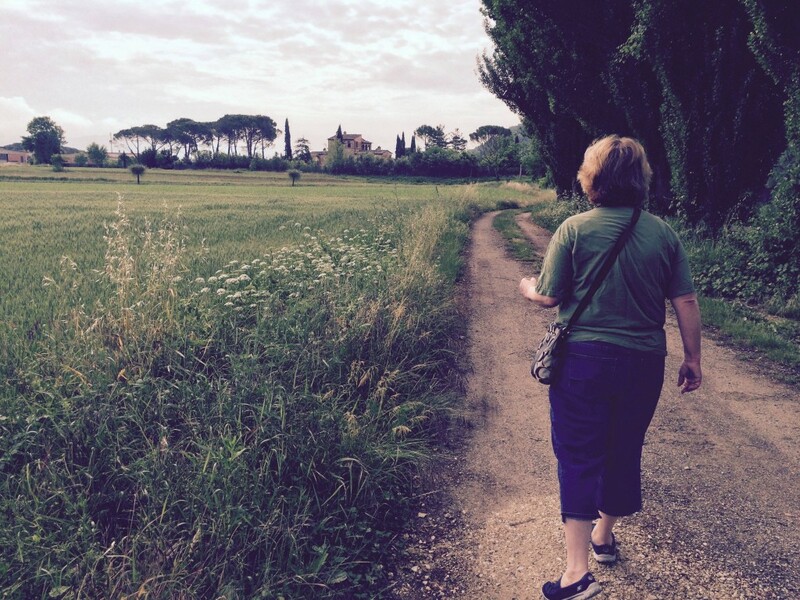 After a challenging and mostly stressful year, we arrived much too tired to our home away from home in Italy. 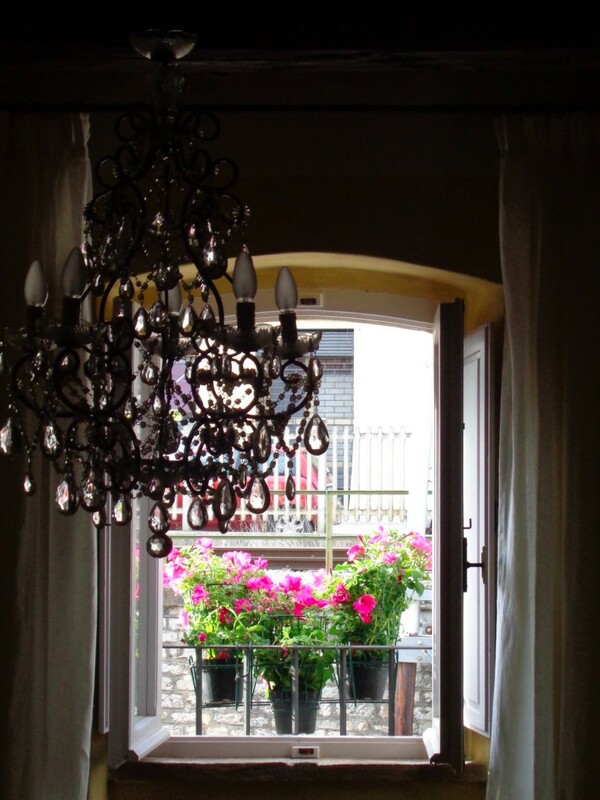 The house has not changed and we welcomed the serenity it offers. After a couple hours of restorative sleep, our first thought was of food. 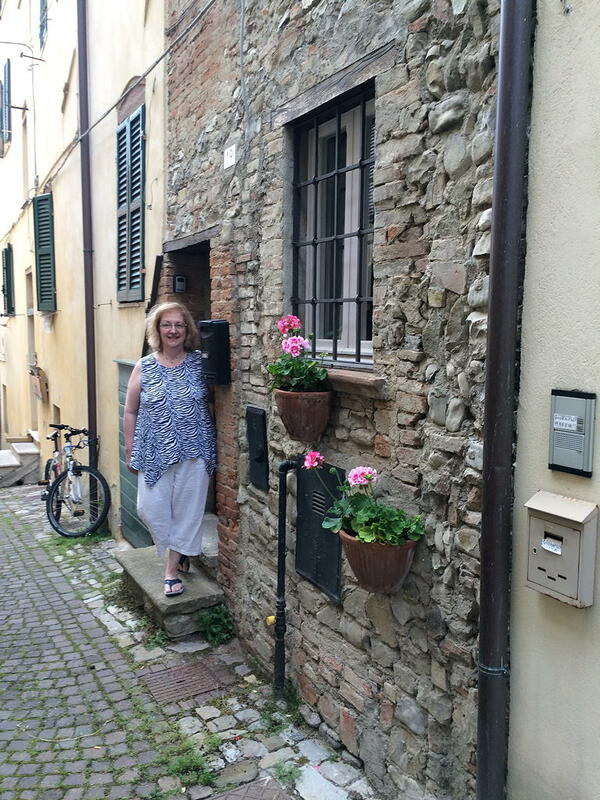 Laura, a neighbor, has a wonderful restaurant a block away, Locanda Appenino, so off we headed. While the low 60s drive most Italians indoors, Mike and I asked if the patio was open and were guided outdoors for a view of the Tiber River, flower blossoms, and the smell of jasmine. Anticipating our first meal of pasta, the menu for the night included roasted chicken and potatoes. I have learned it is best to go with the specials AND chicken (pollo) is rarely on the menu. It was simply divine. 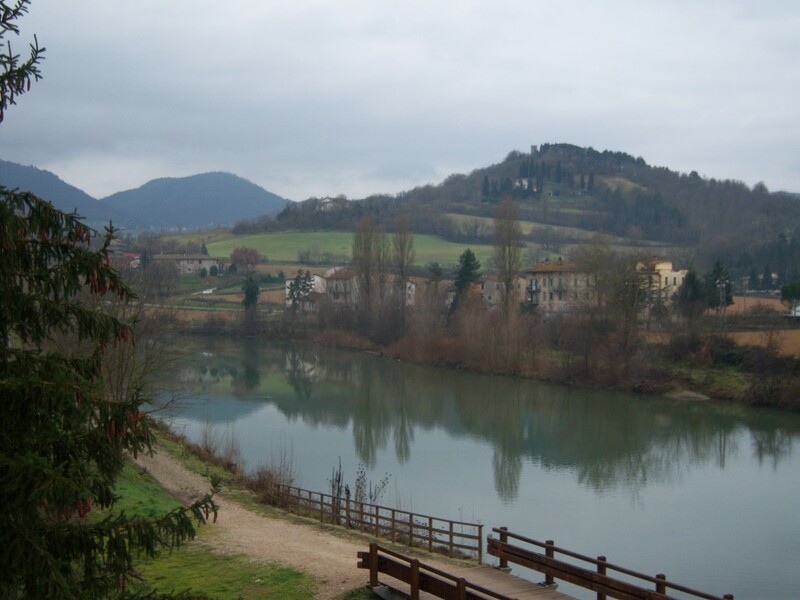 The next morning, we awoke early and walked along the river until it wound back into town ending up at a local bar for breakfast. Not a huge meal in Italy, we were pacified with freshly squeezed orange juice, a breakfast sandwich of prosciutto and omelet, ending with a chocolate filled croissant. We are settling into to our summer routine – reading, writing, and sleeping, with a few errands for good measure. Our next-door neighbors welcomed us back and we stopped and chatted with an English artist we befriended who went native many years ago. He caught us up on all we missed throughout the last year. Umbertide doesn’t have the children, grandkids, or pets. There is no television or movies. Internet has to be rationed. Despite this it offers a much simpler way of life, one that starts off feeling strange but rejuvenates and helps to live productively thought the rest of the year. 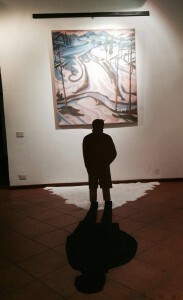 Man and shadow are part of the painting. We received an invitation to an art show about 45 minutes north of Umbertide. 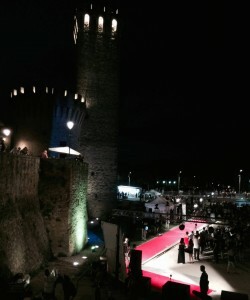 The exhibition was located in a palazzo (palace) in the center of the historic district. 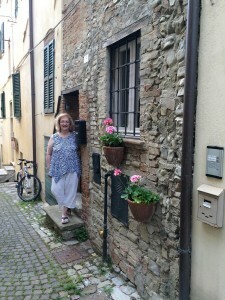 It is only open to the pubic once a year, so in addition to seeing paintings, we were able to glimpse a little bit of an upper class Tuscan home. 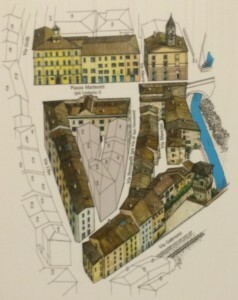 The artist, Vincenzo Calli, has a unique style, blending old techniques with new. I especially enjoyed how he created a “3-D” element by adding sculpture to the painting. Upon leaving the exhibition, we noticed that the narrow street in front of the building had been barricaded for what looked like a race. 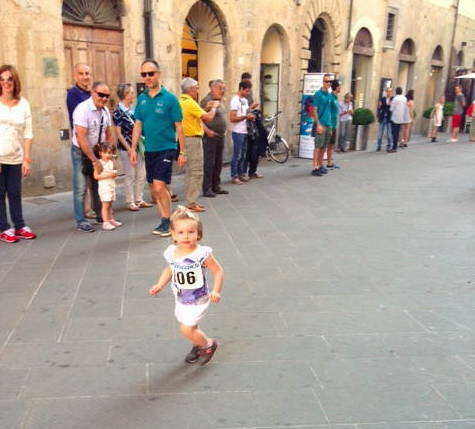 The runners were two and three-year-old boys and girls. The organizers walked the children about a block away and in corrals separated by gender, they raced their way back to the finished line, seeming to enjoy the cheers from the sideline crowds. The last place but cutest racer. Our next stop was the number one restaurant (according to TripAdvisor) in the walled city of Citta di Castello, an Umbrian town about 20 minutes north of us. The friendly owner server us over sized plates of pasta so I was only able to enjoy one course. 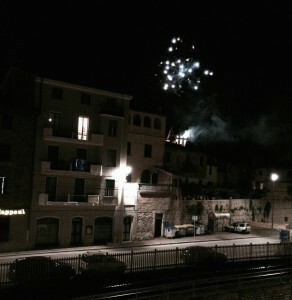 When we arrived back in Umbertide, the town was lit up for a festival. At the base of the Rocco (a former guard tower now an art gallery), a stage was set up with inflatables and fair like vendors. We stayed for a bit watching what seemed to be a warm up acts for something else. We had been told that Cuban dancers were expected. Unfortunately the hour was late and so we left (not before Mike stopped at the local bar to check out the ongoing World Cup game between Germany and Ghana). Several minutes after we readied for bed, I heard the unmistakable sound of fireworks. Our bedroom window points toward the Rocca and we were treated to a show. All of this is to point out that when the evening began, we were going to an art show. As it turned out there was much more to see and do. This was not a special holiday; it is how these people live. 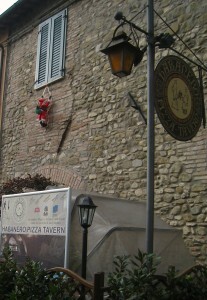 Across the street from our house in Umbertide is a piazza. It is nice place to walk to see people, enjoy a coffee, or a glass of wine. Recently I discovered the area is actually made up of two piazzas. The second one looks like a parking lot but upon inspection, this seemingly common area is actually much more. 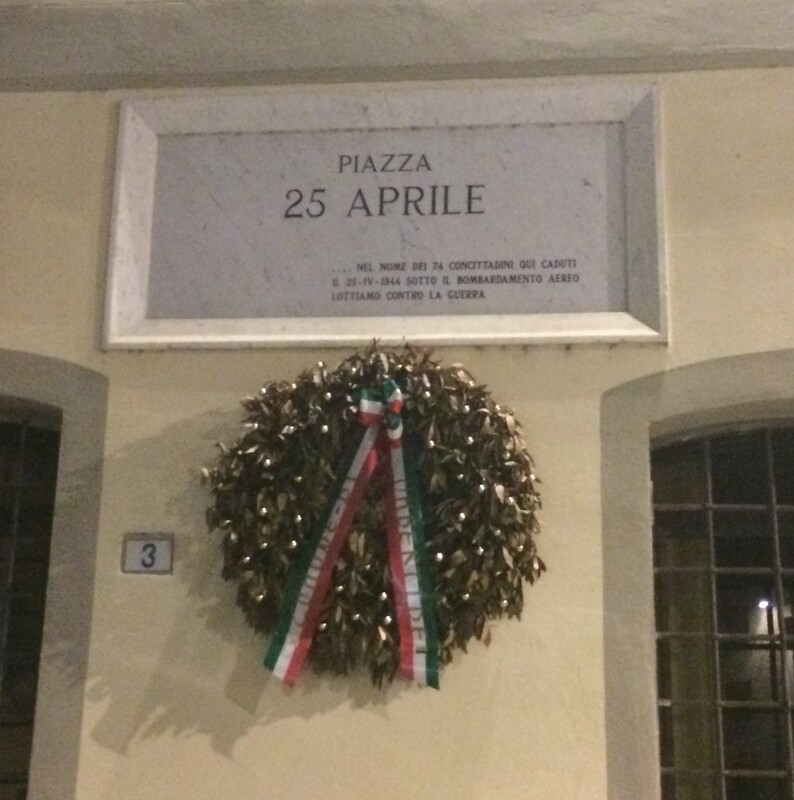 On April 25, 1944 allied bombers aiming for a bridge over the Tiber River, a short distance away, missed and dropped two bombs into the small neighborhood of Borgo San Giovanni, killing seventy people and displacing hundreds of others. The homes were never rebuilt. The buildings in light brown in the center represent those that were destroyed. Today, the area has been renamed Pizza April 25th. Those who died are honored with a permanent plaque of their names. Among the stones of the parking lot are red bricks, which signify the places where buildings once set. A number inside the brick identifies the particular house. I wonder at the idea of never rebuilding and replacing a neighborhood with a parking lot. I am sure what was done was best. Perhaps it is the way to remember. I am a list maker. I can’t get through my day-to-day life without them, experiencing an exquisite thrill as I check off each to do. I am making progress. Therefore despite the fact that there is now time to do nothing, beauty abounds, and the culture encourages the art of enjoying the moment, I am somewhat lost. It is not easy to shed the habits of the other eleven months. In other words I don’t know how to do nothing easily. Yesterday, I decided that we needed to travel to a town thirty minutes away for Saturday market. Several years ago, I found local cookies that I have neither a name nor a flavor to describe them, only a place. I wanted the cookies. There was Saturday market but it has evolved to street after street and bin after bin of clothing. No cookies. I was disappointed and could not check cookies off of my list. We have been hunting for a fire extinguisher since we arrived over a week ago. Despite trips to many different places, we have none. The market town had a hardware store. Surely success would come but alas no fire extinguisher and no guess as to where to buy one. Can’t check fire extinguisher off of my list. The heat has risen and with no air conditioning, ninety degrees is something new to experience. I curled up under a fan, slept and read, still discouraged. 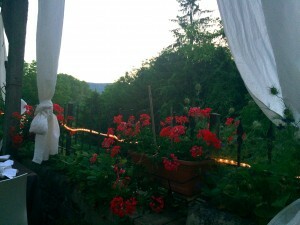 Later that evening, I received a text to join Mike in the piazza for a glass of Prosecco, my favorite wine. I was tempted to decline as I had already drunk a glass but something told to me to accept. With no plan nor list and a sweaty body, I walked across the street. Mike was delighted as he is able to take pleasure in any small thing that life offers. I envy his optimism and child like enthusiasm. He had met several locals, gave and received a language lesson, as well as was treated to a glass of wine. He also had learned where you could refill water bottles for 5 cents a bottle. What a find! I received my glass of sparkling wine from Mary, an extremely friendly bar owner and settled in to people watch. Everyone was coming out to enjoy the Saturday night. I willed myself to just relax and after a fashion, I realized I had. I tried out my Italian with a few people and admired the many dogs that accompany their owners into the piazza. Later we took a walk and learned some interesting history of our lovely town (will share in a later posting). Dinner was eaten in a local Ristorante owned by a young woman and her mother. Almost everything we ate was home grown and homemade, and quite delicious. Another walk through the neighbor hood brought us back to the piazza where at eleven o’clock in the evening, it seemed like they were having a sidewalk sale. We met an Artisan, whose medium is glass, purchasing a set of earrings and a sunflower plate of sculpture. It was on our walk home, that I realized how the real magic of the night was in my allowing it to unfold, without a list. No plans had been made. All I needed to enjoy the evening was a partner to share it with, time, and the willingness to relax. Grazia Umbertide. Coming to Italy while always special is now a regular part of our traveling. This is the first winter trip for both of us and it is the first time we have spent alone in our new home in Umbria. Unlike the summer, the “Green Heart of Italy” is wet, dark, and cold in winter. An umbrella stays at our side. Sunlight is a brief friend. The days are short. Life’s discomforts make one appreciate its beauty. I now understand the Italian love of sunlight and long days in which to do nothing but take a walk or savor the taste of fresh fruit. But we are here now and there is still beauty to be found and had. In the town square is a large Christmas tree; it towers the buildings beside it. I can’t begin to imagine how it was transported and placed there. It lights up the piazza at night and is the centerpiece for the people who still take walks, despite the weather and savor the taste of a fresh tangerine. There is fog. 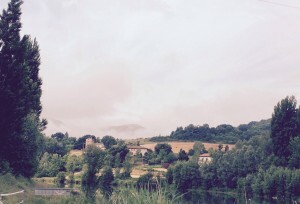 The fog settles over the Tiber River and forming a frame for the old stucco apartments that pepper the hills that overlook the waterway. Looking through this mist creates a different form of beauty but beauty nonetheless. Inexpensive lighting and plastic Santas climbing up plastic ladders suggest the Christmas holiday. 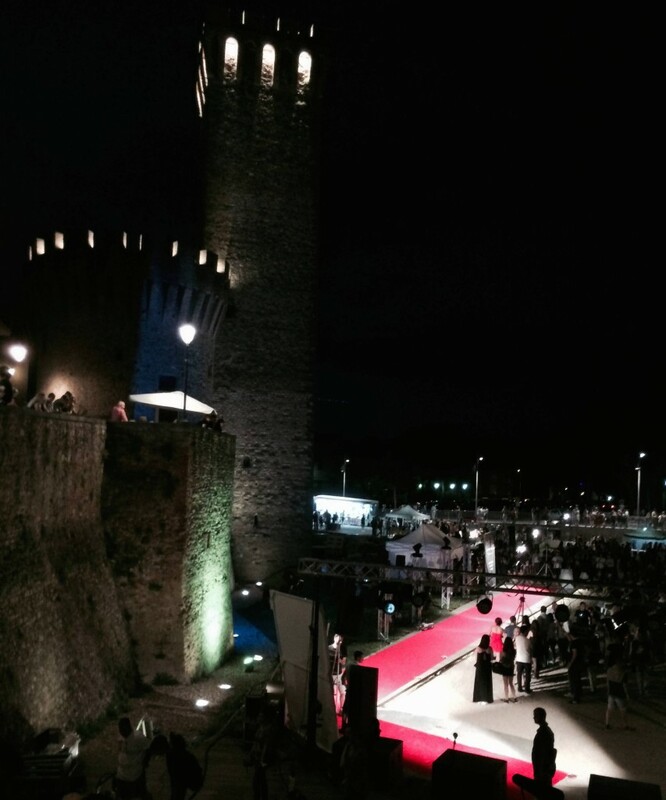 A red carpet is tacked down on the narrow streets of the old city square welcoming one and all to come end give praise to God’s gift, the chance to enjoy a day whether it be the one hoped for or the one given.